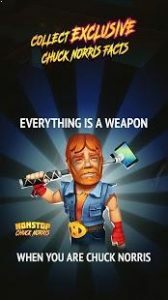 Nonstop Chuck Norris : Harness the unstoppable force that is Chuck Norris in an action game packed with insane weapons, items and Chuck facts! Power up Chuck Norris as he delivers a beating to an infinite horde of villains. The mission: to save multiple universes! But no stress, Chuck will continue to fight and earn rewards while you take a break! Brawl with Chuck’s enemies and save multiple universes! Collect exclusive Chuck Norris facts! PLEASE NOTE: Nonstop Chuck Norris is completely free to download and play but some game items may be purchased for real money. To disable this, turn off the in-app purchases in your device’s settings. Its nonstop knight with Chuck Norris. it has some funny twists, like achievements are “chuck norris facts” and it looks a bit better visually. it also runs smoother. however it also seems the pace is a tad slower but im not far into it yet. disappointed i didnt get my pre registration bonus.